NIA CHARLESTOWN NEVIS (September 08, 2016) — Kerisha Powell and Colin Archibald Jr. of Brown Hill Village and Aljay Newton and Siana Leader of Bath Village left Nevis on September 03, 2016 to attend the G.C. Foster College of Physical Education and Sports in Jamaica to pursue four-year degrees in various disciplines of sports. 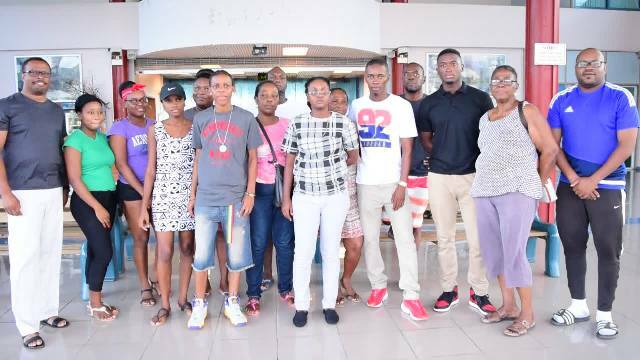 Moments before their departure from the Vance W. Amory International Airport, Newton, on behalf of his peers, thanked the Nevis Island Administration (NIA) for taking the bold initiative to sponsor them with full scholarships to pursue studies of sports. 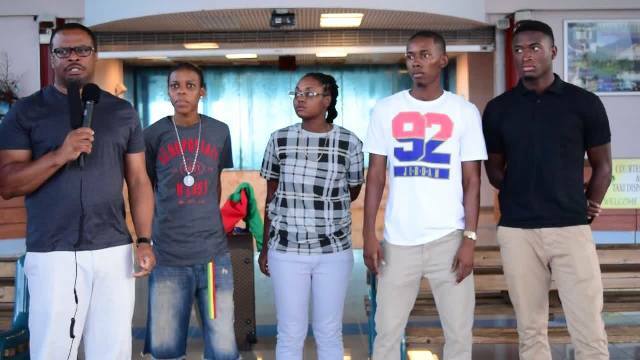 He promised they would be good ambassadors for Nevis during the duration of their studies. Newton singled out and thanked Junior Minister of Sports Hon. Hazel Brandy-Williams and all the “good people” who made the opportunity a reality. Deputy Premier of Nevis and Minister of Sports Hon. Mark Brantley, who was on hand to see the group off to study, said he was doing so with a sense of immense pride. He urged them to make Nevis proud. He wished them well, pledged the administration’s continued support and expressed hope that they would return to Nevis at the end of their studies successful, to help to build the human infrastructure for sports and sports training. “Good luck with your studies. We wish you all the very best and so long as you are there, this government pledges to do whatever we can to support you and to make sure you achieve your individual goals for you and your family but also for the island of Nevis. “Thank you all for stepping up, stepping forward and we look forward to your return to make your contribution to the development of sports in the island of Nevis,” he said. Mr. Brantley, explained, that some years ago the NIA decided to invest more heavily in all aspects of sports. He said the investment in the four students is the largest single one made in one point in sports. The Senior Sports Minister noted that the four candidates who are employed in various capacities at the Department of Youth and Sports, were assessed and offered the opportunity to pursue studies in sports. He noted, that the initiative came about as a direct consequence of a recent visit to Jamaica by Junior Minister of Sports Hon. Hazel Brandy-Williams. While there, she used the opportunity to create a link with the college. She was able to negotiate with them special tuition and accommodation rates for Nevisian students. G.C. Foster College which is located in St. Catherine in Jamaica, describes itself as a world class training institution, producing excellent teachers, sports and recreational professionals to meet local, regional and international standards. Its mission is to contribute to social and economic development through the optimal preparation of Physical Education teachers, athletes, recreation and sports specialists; utilising qualified personnel and contemporary resources. Also present at the airport was Director of Sports Jamir Claxton and family and wellwishers of the students.